If you have ever had to hang up your racket because of tennis elbow, stopped working out because of sciatica or other back pain, or injured yourself on the baseball diamond or basketball court, then you know how frustrating a sports injury can be. Sometimes the cause of the injury seems clear enough, but there may be other times when your body seems unnaturally prone to tendonitis, back pain, neck pain or nerve problems when you play sports. Luckily, chiropractic care can help many Birmingham sports injury sufferers heal more quickly while also reducing the risk of future problems. What are sports injuries, and why do they occur? Many sports tend to overwork particular joints by their very nature. 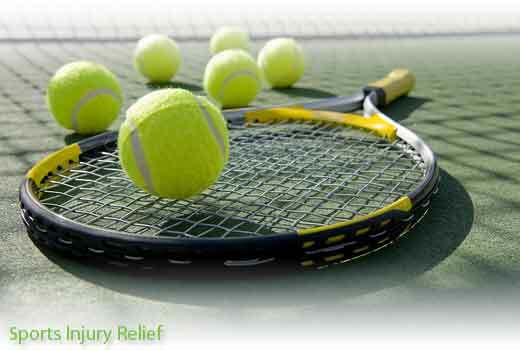 Tennis, for instance, puts enormous stress on the elbow as you swing a racket back and forth almost continuously. This repetitive stress, which rubs the tendon on the outside elbow against the bone, leads to the pain and inflammation commonly known as "tennis elbow." Football players commonly suffer hamstring injuries and neck pain. Repeated impacts to the body, especially when a spinal misalignment already exists, can cause a bulging disc and back pain that makes it impossible to run, bend over or twist your body. Even tiny misalignments in the spinal column can throw your body off balance, putting extra stress on certain muscles as they try to compensate. This stress makes you more prone to muscle injury, tendonitis and nerve pain, including the debilitating back pain and leg numbness associated with sciatica. Here at Back On Track Chiropractic and Wellness Center in Birmingham, we can treat your sports injury without resorting to extreme methods such as surgery or deadening your pain -- and your ability to function -- with drugs. Our chiropractor, Dr. Scott Duca, can pinpoint the source of your pain and recommend the proper course of treatment. We start by using advanced diagnostic techniques to evaluate your injury and your overall health. Chiropractic adjustment can correct troublesome spinal misalignments, relieving pain and allowing your muscles to work correctly at whatever sport you play. Since we believe in taking a holistic approach to our patients' health, we do more than simply adjust bone positions. We may apply braces, straps or tapes to hold the injured body part in a corrective or stabilized position and prevent you from re-injuring it. We may prescribe massage or other therapies to boost circulation for faster healing. We can also instruct you in easy home care techniques such as the application of ice or heat, how and when to begin working the injured area again, and exercises to strengthen muscles, improve posture and help you avoid future sports injury in Birmingham. If you live in Birmingham, Homewood, Vestavia, Mountain Brook or Hoover, and you need help for sciatica, a bulging disc, or repeated strains and sprains and other sports injuries, contact our Birmingham office today at 205-623-5782.